Congratulations to Kate for winning the “perfect” homework contest for April. She not only had all of her music theory homework worksheets correctly completed, but she also completed the “Race to Name the Notes” in the fastest amount of time–Under 10 seconds. 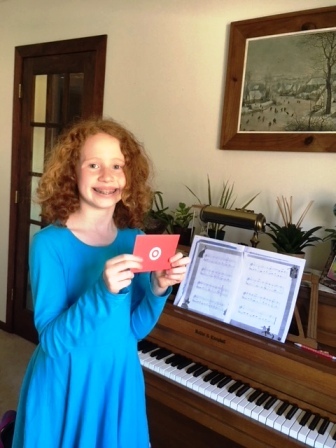 Kate won a gift card to Target. Great job Kate! Please note that all competitions have ended until the Fall Schedule begins in late August. Too many students miss lessons on a frequent basis during May-mid August due to sports and vacations to be able to run a fair competition.